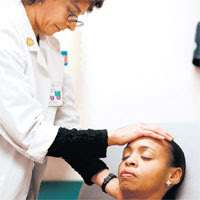 New York: An unconventional therapy called the healing touch is gaining acceptance as complementary aid in some US hospitals. Although research on the technique – which uses light touch and deep breathing – is limited, it is practiced at 30 US hospitals and by nearly 2,000 certified therapists, according to Healing Touch International (HTI). The system incorporates ancient Asian healing techniques and was developed in the 1980s by a nurse, Janet Mentgen. A healing touch therapist will gently touch or glide his hands through the patient’s energy points or affected areas, such as shoulders, feet and forehead. The practitioner concentrates on each point for a few minutes. The US National Institutes of Health (NIH) classifies it as “energy medicine,” in which practitioners believe illness results from disturbances of subtle energy fields, and calls it controversial. The NIH says neither the external energy fields nor the therapeutic effects have been demonstrated convincingly. However, some hospitals, including the New York University Medical Centre, have approved it as a complement to traditional rehabilitation. Lisa Anselme, executive director at the HTI, stresses the method was not meant to stand alone. “Healing touch is not intended to replace standard treatment. It’s a complementary therapy,” said Anselme, a registered nurse and healing touch practitioner. Users of the controversial therapy agree.